114 Rue Amelot, 75011 Paris, Tel: 01 43 55 87 35. 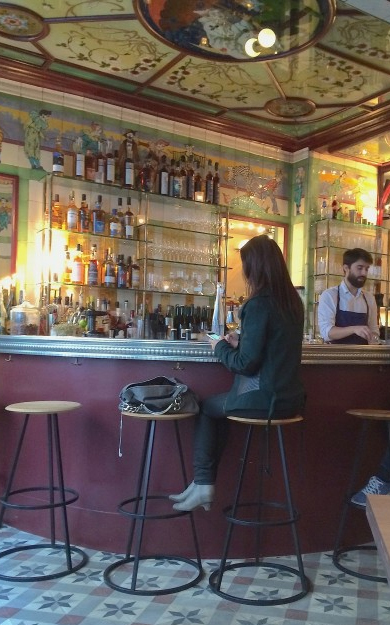 Next to the Cirque d’Hiver (between the Place de la Republique and the Bastille, in the area of the best contemporary galleries ), the Clown Bar is one of the most charming places in Paris for a quick bite and a glass of wine. Now under a new management team and a talented Japanese chef (Sota Atsumi) to run the kitchen, the Clown Bar proposes focused menu, that changes often, of small and original plates, which you can easily mix and compose into a pleasant and very satisfying meal. There is a very pleasant and large terrace out front, but sit inside is worthwhile : you will enjoy a beautifully restored little dining room, French Belle Epoque original decor, with a glass ceiling in the bar area painted with a circus theme. A vintage setting completed by a sleek contemporary furnishings, and a diverse but stylish Parisians crowd. And please try the « Beignets au camembert » or « Beignets de bulots » and don’t leave without trying at least one desert !